Home › Stories › Community Raises $175,000 For 89-Yr-Old Popsicle Vendor Struggling To Provide For Orphaned Grandchildren. Community Raises $175,000 For 89-Yr-Old Popsicle Vendor Struggling To Provide For Orphaned Grandchildren. A kind act by one man set off an avalanche of kindness from strangers, and provided one hardworking, elderly man with more than $175,000. 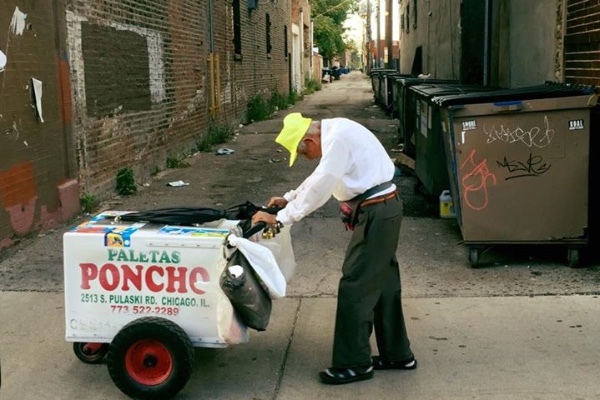 Fidencio Sanchez has been strolling the streets of Little Village in Chicago selling paletas, or Mexican ice pops, for more than 23 years. It used to be a family affair until his wife became too weak to help out with the business. A few weeks ago, the 89-year-old man tragically lost his daughter, leaving he and his wife to care for their two grandsons. “We thought, ‘What are we going to do? We have to pay the bills,'” Sanchez said. So he continued to do what he had been doing all along, working almost sun up to sun down, in every season, providing delicious ice cream for the community. Joel Cervantes Macias was visiting his old neighborhood when he saw the familiar face of Sanchez still pushing the cart that he remembered as a kid. “It broke my heart seeing this man who should be enjoying retirement still working at this age,” Cervantes said. Macias pulled over to take a picture of him to share on social media, bought 20 paletas and paid him $50 (more than the cost). Once he heard about Sanchez’s recent loss, he was heartbroken. Macias’ friend Joe Loera had the idea to start a GoFundMe fundraiser to raise $3000 to help Mr. Sanchez with expenses, but the response was overwhelming as people who recognized the ‘paleta man’ started to give and share the page with others. More than 8,000 people have contributed over $176,000 to the fund in just two days! Sanchez still plans to keep working for now but is finally considering retirement. What a beautiful conclusion for this kind and caring man.